After an easy shinkansen ride up to Tokyo, through which Jess remained rather passed out the entire time, we made our way to Sendagi where we met up with Tomo. Tomo very kindly let us rest up and refresh ourselves, and then we took off for Akihabara, a must see on Jess’s tourist agenda since he’s not only an anime fan, but also works in the videogame industry (where he was once able to use his mighty powers to connect me forever, in however minor a way, with the Star Trek universe). Akihabara is a strange mix of tech-geek desire, cute and pornographic animation iconography, object fetishism (ranging from audiophile tube amps to obscure anime-derived figurines), the latest video entertainment, cosplay emporiums, video arcades, and the now ubiquitous Maid Kisa. As you walk through Akihabara you are barraged with the sonic detritus of video game parlors, street barkers hawking the latest electronic wares, touts of all sorts trying to get you to follow them to one popular maid café or another, and even the occasional street performer. Our first stop was a quasi-militaristic store selling reproduction guns that shoot small, plastic balls instead of bullets. Paint ball guns are banned in Japan — as are actual guns, of course — so weapons enthusiasts are forced to buy incredibly elaborate and realistic-looking reproductions that are actually more harmless than a Daisy air rifle. Of course, this kind of fascination with military equipment is simply another example of otaku culture. While otaku are usually associated with an obsession for anime and manga, the category can actually be extended to any form of “mania” (the standard Japanese term for anyone with an overdeveloped fascination for any particular thing — in my case that would be audio equipment, cameras, weird music, and comic books, though my comparative level of otaku-ness is relatively low). 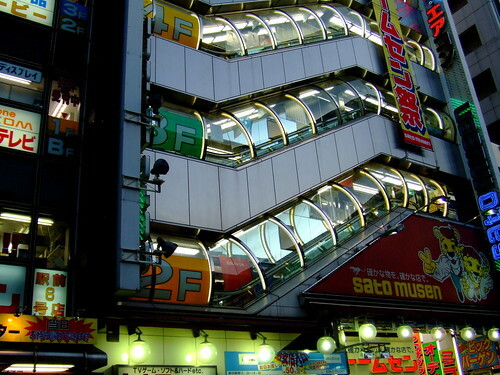 The buildings in Akihabara contain story after story packed full of shops that range from videogame emporiums to small individually run stores that sell a variety of otaku related collectibles (vintage Godzilla figures, Gundam model kits, animated ‘blue’ videos, etc.). Walking through these buildings is like walking through a strange kind of cultish warren where you continually emerge into someone else’s (and occasionally your own) fantasy space. The stores and video parlors inside these buildings are cut off from the outside world and, much like in a Vegas casino, it’s easy to lose track of time and orientation. Orange glows, a beeping noisescape, the wallpapering of animated characters, women in costumes, men with backpacks and bandannas, the unending flow of people looking through an ungodly volume of goods — all of this quickly becomes the normal background environment in which you are immersed. 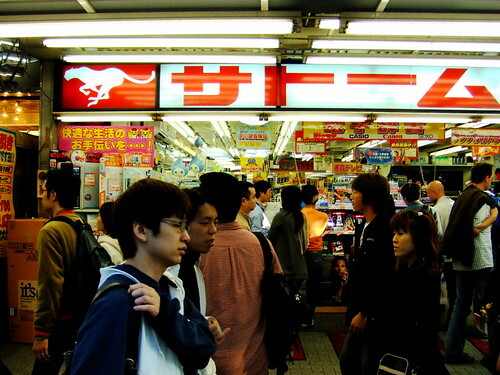 Frequenters of Akihabara have been given the name “Akiba-kei,” which can roughly be translated as “the Akihabira tribe”. Akiba-kei culture actually involves values that are significantly different than those of mainstream Japanese society, and it is this that sets the Akiba-kei apart. 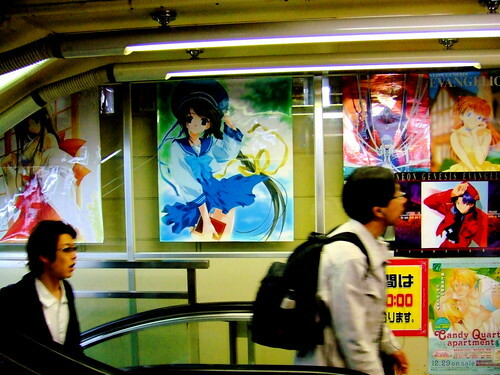 While manga and anime are immensely popular among all sectors of Japanese society, Akiba-kei culture puts the object of pleasure above all else — including normative social standards of behavior. 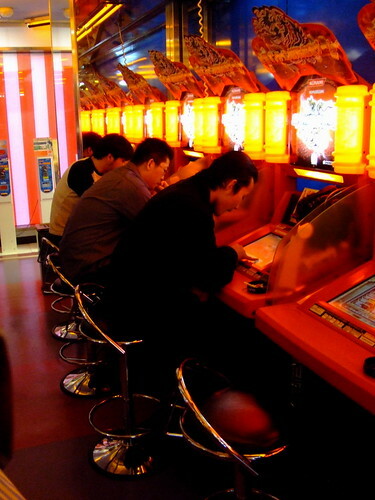 The radical embrace of pleasure and fantasy by the Akiba-kei is a rejection of both social conformity and the demands of family structure and this positions Akiba-kei culture on the margins, though strangely the obsessions of the majority of the Akiba-kei — anime and maga — are firmly at the center of contemporary Japanese culture. Here’s a typical street-level view of Akihabara. 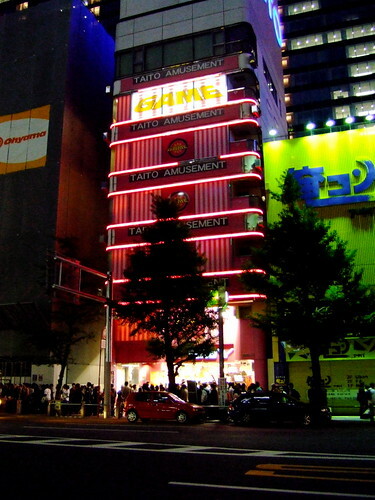 This is an eight-story building — the 4th floor has your “terebee-gamu” (videogames), you can buy CDs/DVDs on the 2nd floor, and the 7th floor sells books (probably almost entirely manga). Note the maid outfit on the character above the awning. 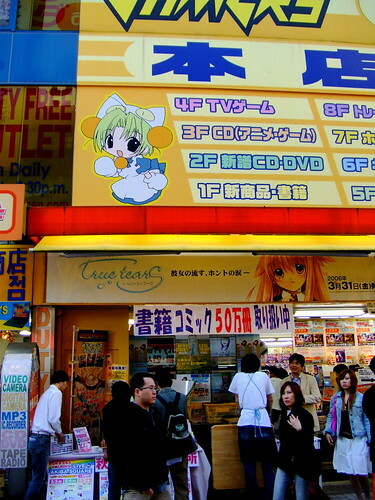 This is another typical Akihabara street scene — this time outside of a more electronics-oriented store. 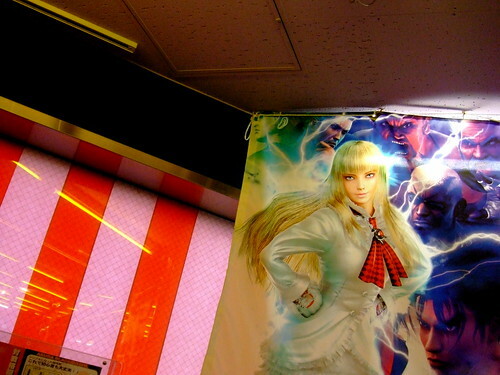 Inside one of Akihabara’s many video arcades. I think we’re on the third or fourth floor here. Here’s a view outside of one of the stores in Akihabara that specializes in bishojo wares, which are often highly suggestive (if not downright pornographic). Most of these stores are very serious about not allowing photographs. I’m not quite sure why this is, since there’s no secret about what’s being sold in these stores (and indeed, many pseudo-pornographic capsule toys are available in vending machines on the street). Perhaps these stores simply want to discourage subculture tourism on the part of people who only come to Akihabara to gawk. 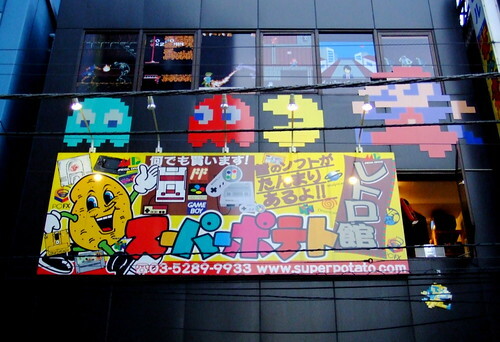 This is one of the more famous buildings in Akihabara. The exposed exterior escalators remind me a bit of the Pompidou Center. The sure signpost of a vintage gaming store. Vintage gaming stores are awesome. Anyone care for a Famicom and some old tape-based games? Night in Akihabara. That’s a lot of people milling around outside of a building that’s dedicated entirely to gaming.